Scenario & Procedure: Scenario: 3 Gang members and their 6 dogs are threatening your life. Defend yourself. Start Position: Standing at P1, facing 90 degrees right or left, gun holstered and loaded to division capacity. Procedure: At the signal, turn then draw. 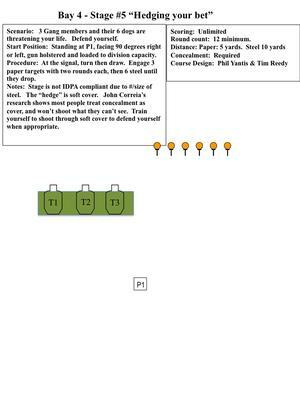 Engage 3 paper targets with two rounds each, then 6 steel until they drop.